We have lots of lolly-makers on staff! 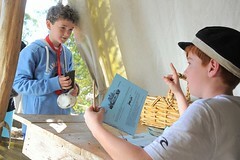 Many students who visit Sovereign Hill tell us they would love to work in a museum when they grow up. What kinds of jobs can you do in a museum and how do you get one? 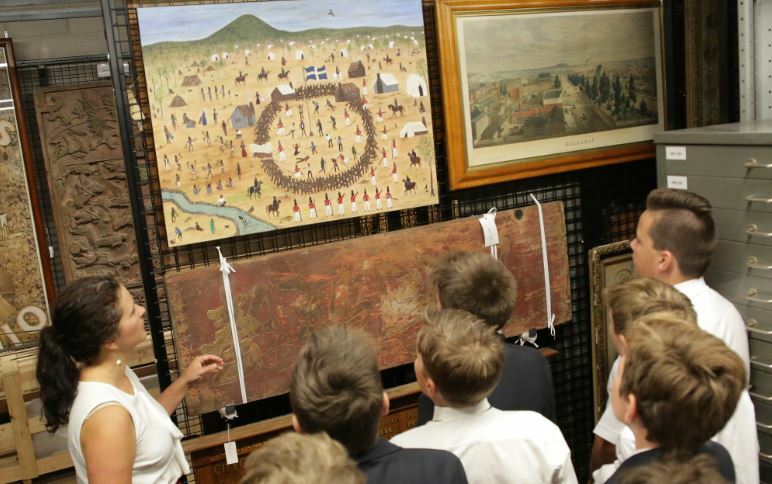 All museums in Australia employ people to do lots of different kinds of jobs, from curators who create beautiful exhibitions of artefacts (rooms creatively filled with artefacts that tell fascinating stories), to marketing managers, educators, cleaners, historians, volunteer coordinators and much more! One of our many musicians who play music in the street. 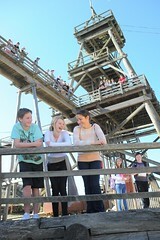 However, Sovereign Hill is a bit different to most museums in Australia because it’s a living, or outdoor museum. This means it doesn’t really tell stories using artefacts behind glass cases. 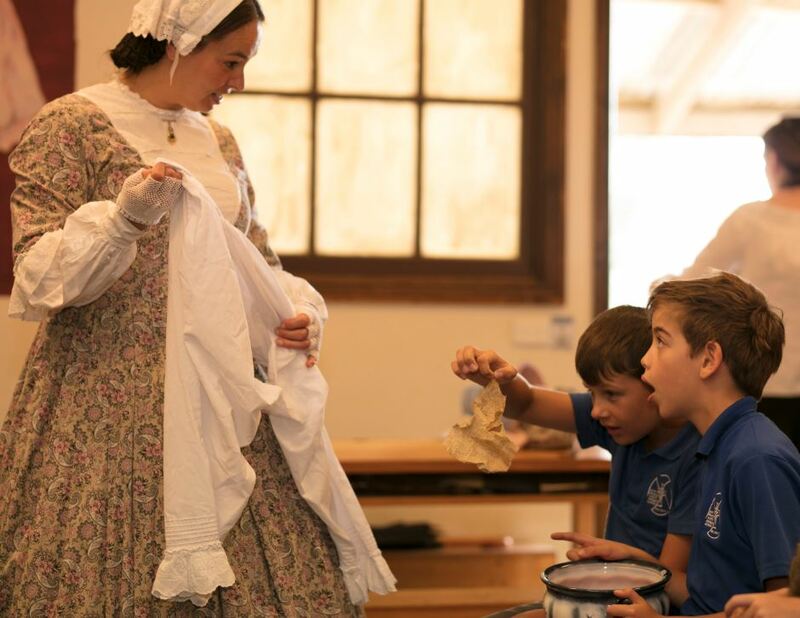 Instead, at Sovereign Hill we use costumed characters, homes and shops you can visit, and hands-on activities like gold panning to teach people about Australia’s gold rush history. 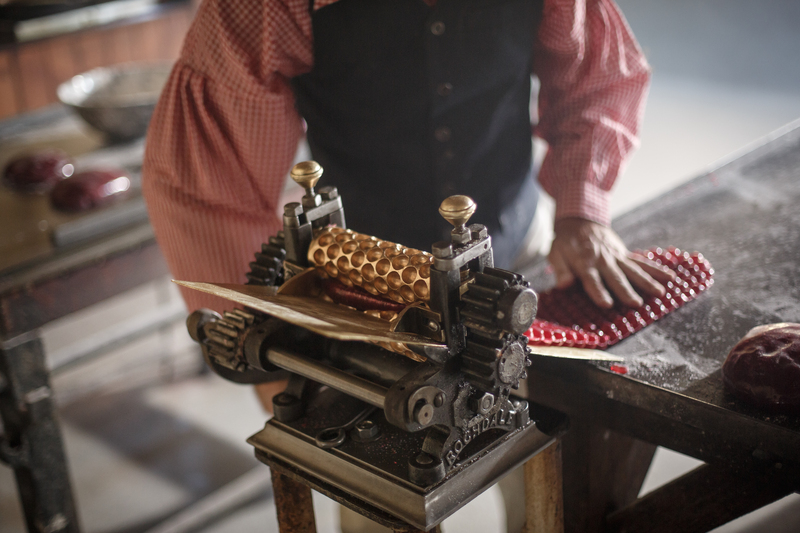 This means Sovereign Hill employs a small village-worth of people with many different skills – and that’s because we practically are a small village! We have about 300 staff members and as many volunteers, some of whom you see dressed in 1850s fashion in the streets or in the shops, while others are hidden ‘behind-the-scenes’, working on things like museum management, visitor safety, advertising, website design and creating education resources. Many people want a job in a museum because they’re such interesting places to work. This means each advertised museum job usually has lots of applicants, making it a very competitive industry. So, if you want to work in a museum, you need to dream big! 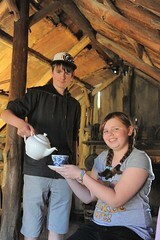 There are members of staff at Sovereign Hill who began their museum careers as volunteers or work-experience students, and are now working as part of the professional museum team. So achieving your goal of working in a museum is definitely achievable. Our Collections Manager taking students for a back-of-house tour at the Gold Museum. If you would like to become a museum curator and manage/create museum exhibitions (like Bunjilaka at Melbourne Museum, for example), you need to be an organised and creative person. You should go to university to study ‘Museum Studies’ or ‘Cultural Heritage’, to a postgraduate or masters level (this means you will spend at least 4 years at university). Any of these qualifications may help you get a job in a museum as a curator. If you would like to become a collections manager, which means you take care of the artefacts a museum has to look after (a little bit like a librarian), you need to be systematic and good at problem solving. You should get a similar qualification to a curator. 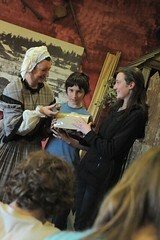 One of our education officers teaching students about chamber pots. If you would like to become a museum educator, which means you create and teach lessons to school students visiting the museum, you need to be good at public speaking and time management. Most museum educators are qualified teachers, which, in Australia, means that you have been to university for at least 4 years. 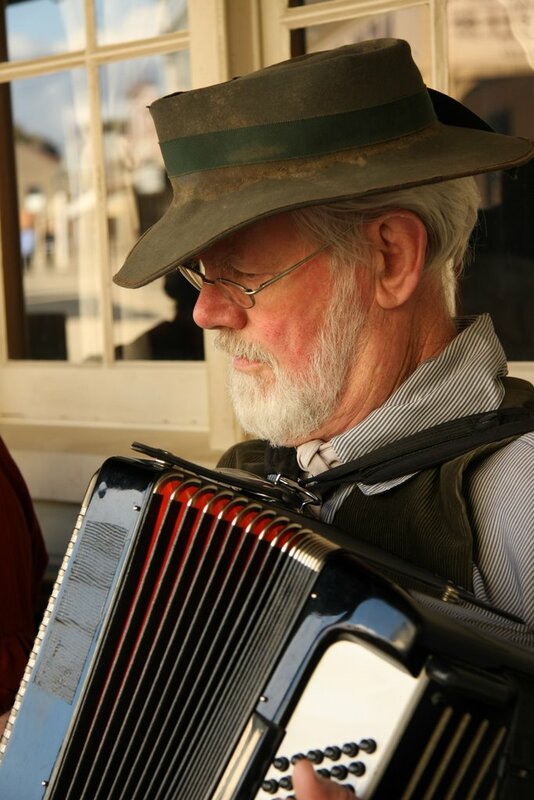 The Sovereign Hill Museums Association’s 11 educators (working across the Sovereign Hill Outdoor Museum and Narmbool) studied many different subjects at university; some are History teachers, while others are Science, Literature or P.E. teachers, which means they all bring different skills to the job. 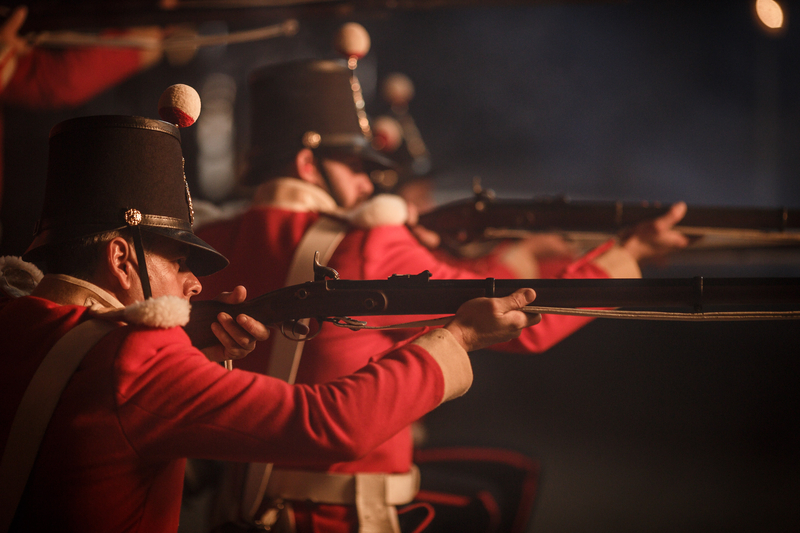 Some actors dressed as Redcoat Soldiers. 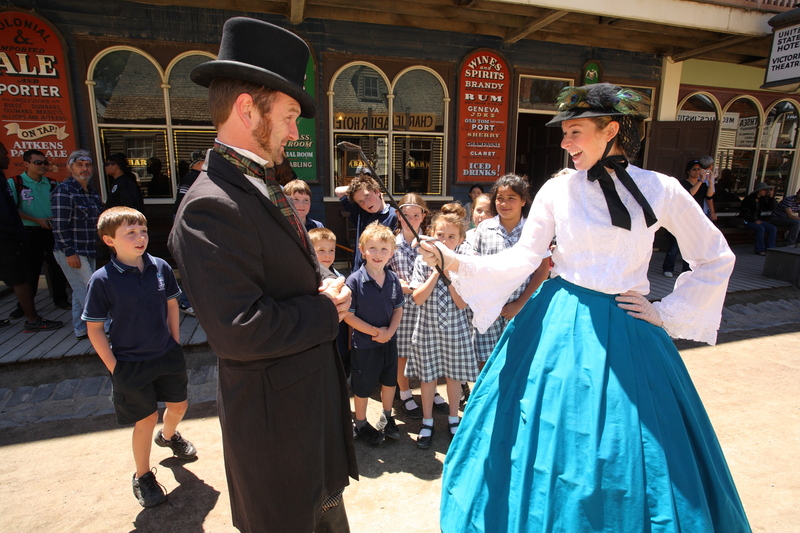 Sovereign Hill also has a large number of talented actors who perform in the streets and in the Victoria Theatre. Many of these actors are currently studying or have already completed a university degree in Drama, also known as Performing Arts. 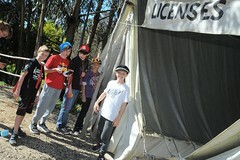 Sometimes it can be difficult for actors to find work, but if you get a job at an outdoor museum like Sovereign Hill, you could be acting in historical costume every day – in the street, in pantomimes, and in conversations with visitors during which you have to stay in 1850s character (so, no talk of Minecraft, cars or telephones!). Some of our wonderful actors have been working here for more than 20 years, which means it’s probably safe to say that they really enjoy their jobs! 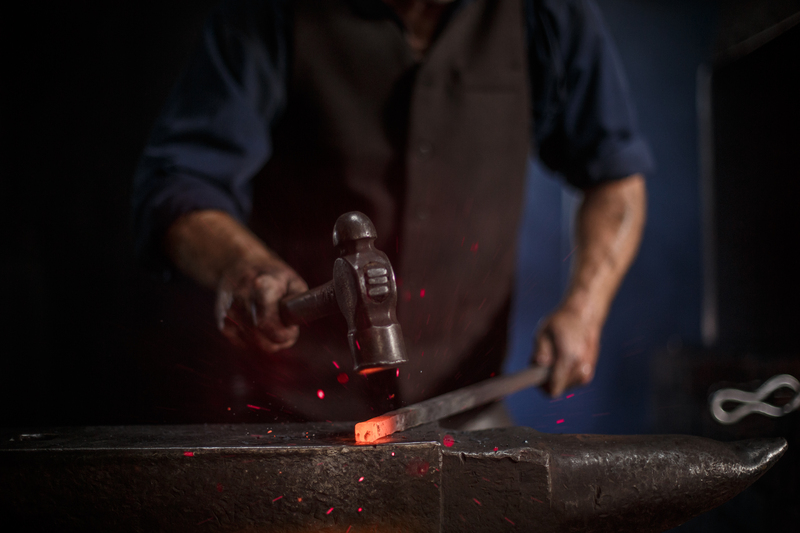 Blacksmithing is a rare trade in the 21st century. 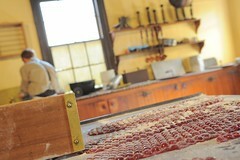 Some other jobs that you won’t find in too many other museums are the jobs of Sovereign Hill’s rare tradespeople. The living museum features technology from the 19th century, like boilers and steam engines, and therefore jobs that don’t exist in too many other places in 21st century Australia. If you want to be a blacksmith, 19th century steam engine mechanic, or driver of a horse-drawn coach, Sovereign Hill is the workplace for you! 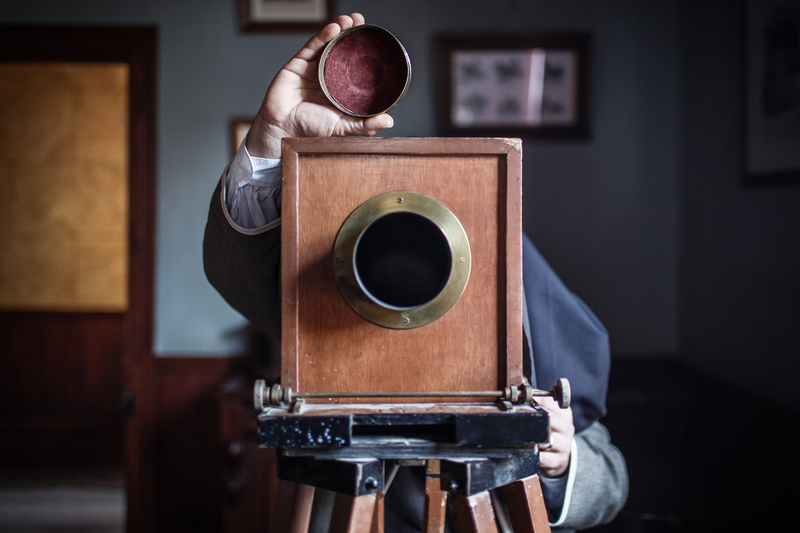 Most of these professionals were given on-the-job training here at Sovereign Hill, because it’s hard to learn these skills anywhere else. Similarly, we have a highly-skilled Costume Department, the members of which have university qualifications in Fashion or Textile Design, but they also learn a lot on-the-job because there aren’t too many places making Redcoat Soldier outfits, or 1850s bonnets these days. Our photographer hard at work. Additionally, Sovereign Hill is lucky to have a team of very skilled builders and (modern) tradespeople, to keep our museum looking just like Ballarat did in the 1850s. We also have a large staff of hospitality workers and cleaners, receptionists and salespeople. Our Design Department makes all of our 19th and 21st century signs and advertising, and the Marketing Department manages visitors from all over the world and runs special events like ‘Winter Wonderlights’. We have people who design and care for our beautiful gardens, photographers who take your stylish 1850s photo, food technologists who create new lolly flavours, administrators, volunteer coordinators, bookings officers, historians, animal handlers, hotel managers, IT magicians, and horse-pooper-scoopers. 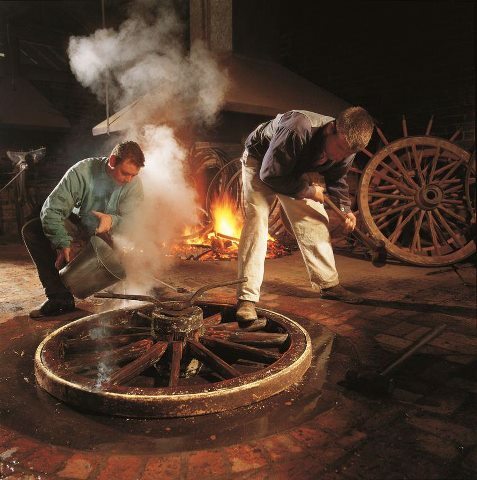 Our wheelwrights ‘hot tyring’ a coach wheel. 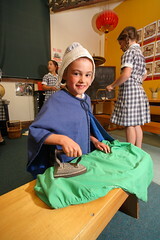 There really is a job for everyone at Sovereign Hill! If there’s a Sovereign Hill, Gold Museum or Narmbool job that you would like to know more about, let us know in the comments below. Lola Montez, painted by Joseph Stieler for Ludwig I of Bavaria, 1847. Reproduced from Wikipedia Commons. Most afternoons at 2.30 pm in Sovereign Hill’s Main Street, an actor playing Lola Montez bursts onto the balcony of the Victoria Theatre, fuming loudly about a bad newspaper review of her ‘Spider Dance’. Let’s find out more about this extraordinary woman. 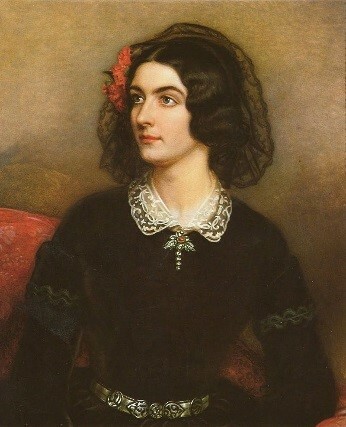 Marie Dolores Eliza Rosanna Gilbert (c.1818-1861), better known by her stage name Lola Montez (or Montes), was a well-known 19th century celebrity and beauty before she arrived here in Ballarat in 1856. Although she was born in Ireland, she became a ‘Spanish dancer’ and was particularly famed for her Spider Dance, during which she flashed her underpants (called pantelletes), and maybe even the body parts beneath them … For men living on a goldfield where there were very few women, the naughty Lola was a subject of great interest. Around the age of 22, Lola began her career as a dancer in Europe. This was also the time people began calling her a courtesan, a old-fashioned name given to a woman who was a close friend, confidante and sexual companion to rich and powerful men. Many of her famous male friends were artists, writers, journalists, and army lieutenants. She was even the ‘favourite’ of King Ludwig I of Bavaria (now part of Germany). 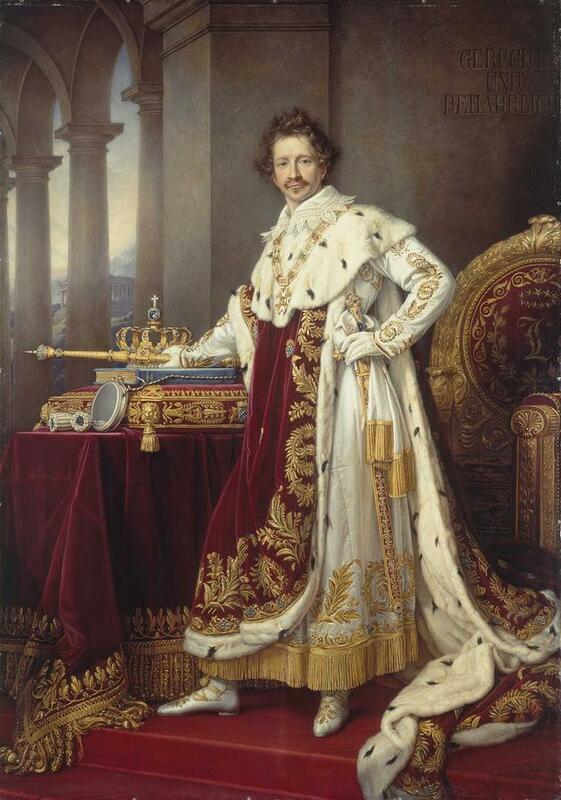 Portrait of Ludwig I of Bavaria, by Joseph Stieler, 1825. Reproduced from Wikipedia Commons. Such relationships gave her money and power, which meant independence (uncommon for a 19th century woman). After a revolution in 1848, during which King Ludwig I gave up his crown, she left for England and later moved to the United States of America, in 1851. There, she performed as a dancer and actor for the gold miners of San Francisco. 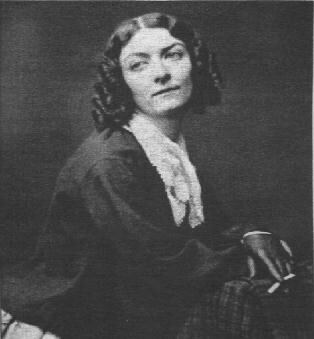 Then, in 1855-6, she toured Australia and danced for the miners in Ballarat and Castlemaine, among other places.Beyond Lola’s career as a performer, she part-owned a French newspaper, published a book called ‘The Arts of Beauty; Or, Secrets of a Lady’s Toilette. With Hints to Gentlemen on the Art of Fascinating’ (1858), and gave ‘moral lectures’ just before she died in 1861. In California there is a mountain named in her honour, along with two lakes, and numerous books and movies are about her or feature characters based on her life. Many historians think she was a woman ‘before her time’ as she ignored pressure to be a quiet and obedient woman at a time when that was expected. She broke the rules, and lived as she pleased. Lola c.1851. She was the first woman to be photographed smoking a cigarette. Reproduced from Wikipedia Commons. The following is a recipe for making another wash for the face, which is a favourite with the ladies of France. 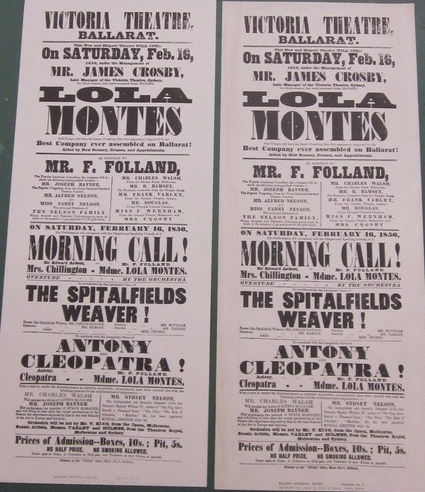 Posters to advertise events at Ballarat’s Victoria Theatre, featuring Lola ‘Montes’, 1856. Reproduced with permission from the Gold Museum, Ballarat. Lola married at least three times during her life; however, her romances never seemed to last very long. Some of these relationships ended in divorce, others in death; even her manager met a grisly end – he fell off a ship and disappeared in the Pacific Ocean. In 1861, Lola died of syphilis (an STI – sexually transmitted infection), alone, at the age of about 39 in New York City. The performance about Lola’s life, which you might be lucky enough to see at Sovereign Hill, details the story of her reaction to a bad review … A man named Henry Seekamp who was the editor of The Ballarat Times, the city’s first newspaper, famously criticised Lola for her spicy performances through a review in his newspaper. When Lola read this review about how ‘immoral’ her dancing was, she confronted Seekamp in the street and beat him with a horse whip. This event only made Lola more famous (or infamous) as it was reported in newspapers all over the world. Two of Sovereign Hill’s actors re-creating the famous incident between Lola Montez and Henry Seekamp, involving her horse whip. While you may think that hairdos in history aren’t really worth studying, they can actually tell us a lot about what life was like in the past. A hairdo can tell us about technology, through the kinds of products historical ‘dos’ required, or about fashion and making a statement, or about social class (whether you were rich or poor, powerful or powerless … ), and it can even be handy for dating historical paintings and photographs! 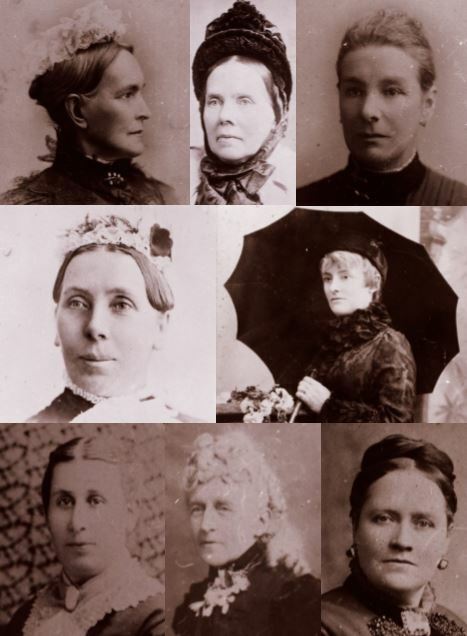 A collection of unknown Ballarat women from the Gold Museum collection sporting a range of 19th century hairdos. Reproduced with permission from the Gold Museum. For thousands of years, people have enjoyed using hair from their heads to decorate their bodies. Hair can be a very important part of someone’s identity; it can relate to religion, law (yes, there have been laws in history that have controlled hairdos!) or simply fashion, and, of course, hairdos are closely linked with humanity’s various and ever-changing ideas around beauty. 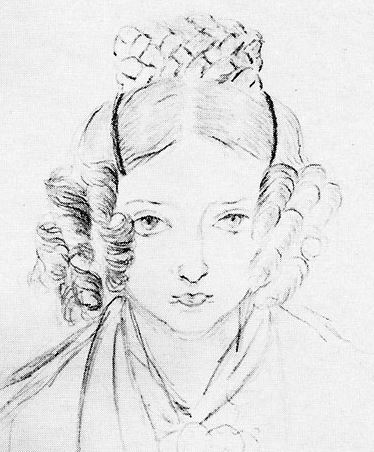 Self-portrait of Queen Victoria, 1835. An image from Wikipedia Commons. In the 19th century, hairdos for women in the British Empire (which included Australia) tended to follow the style of Queen Victoria, who reigned for 63 years. This powerful woman had a huge influence over all things fashion, and is even thought to be the bride who popularised the white wedding dress, which many women still wear today. Before her time, British women simply wore their best dress on their wedding day, whatever the colour. Fashions in both hair and clothes changed a great deal during her time as queen, as you can see here. 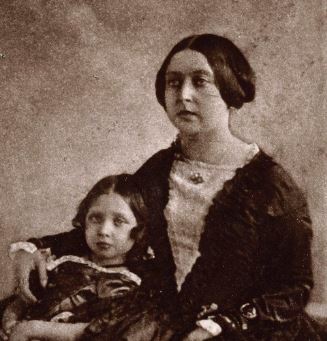 The first known photograph of Queen Victoria, pictured here with her eldest daughter, c.1845. An image from Wikipedia Commons. By the 1850s, Queen Victoria tended to wear her hair parted in the middle. It was either pulled back behind the ears (which would then be covered by a day cap/bonnet), or would be used to cover the ears when a head covering wasn’t necessary (at a ball, for example). Otherwise, she, like the millions of women in her empire during this time in history, covered their heads out of Christian politeness, and always when outside (providing they could afford it!). Not only did wearing head coverings out of doors keep your hair clean before the invention of the shower and hair dryer, they tended to protect you from sunburn. And back then, fancy ladies wanted the whitest skin possible – ‘Only peasants and natives have tans!’. Beauty ideals like these demonstrate how acceptable racism (and classism) was in the 19th century. For men, the beginning of the 1800s saw the end of elaborate powdered wigs and a return to natural hairstyles and colours. A few decades later and beards and moustaches also came into fashion. A male fashionista of the time, Beau Brummell, led the way with these new, relaxed, natural hairdos, which got shorter and more controlled as the century rolled on. Hair styling products such as hair oil became popular with men during this time; however, they didn’t have the means to wash it out like we do today (with shampoo) until the 1890s. The first shampoos were powders, and it wasn’t until the 20th century that we saw the invention of liquid shampoos. Most people’s washing habits in 1850s Ballarat mirrored those practiced in England; however, clean water (that which wasn’t polluted by goldmining or human waste near it … ) on the diggings was often hard to come by. Miners and their wives would pay a lot of money – particularly during dry summers – for buckets of fresh water taken from what was then called Yuille’s Swamp (now Ballarat’s Lake Wendouree). Bathing usually only happened once a week (typically on Saturday nights so the family was clean for church on Sunday), but that bath wasn’t for washing hair, and besides, you had to share the water with your entire family because it was so scarce! Photograph of an unknown man dubbed the “Chinese Giant”, 1870. Notice his long queue. Reproduced with permission from the Gold Museum. Of course there were many nationalities present on the Ballarat goldfields, which meant yet more hair styles could be seen around 1850s Ballarat. One of the most striking hairstyles common during this era was the ‘queue’ worn by Ballarat’s many Chinese miners. 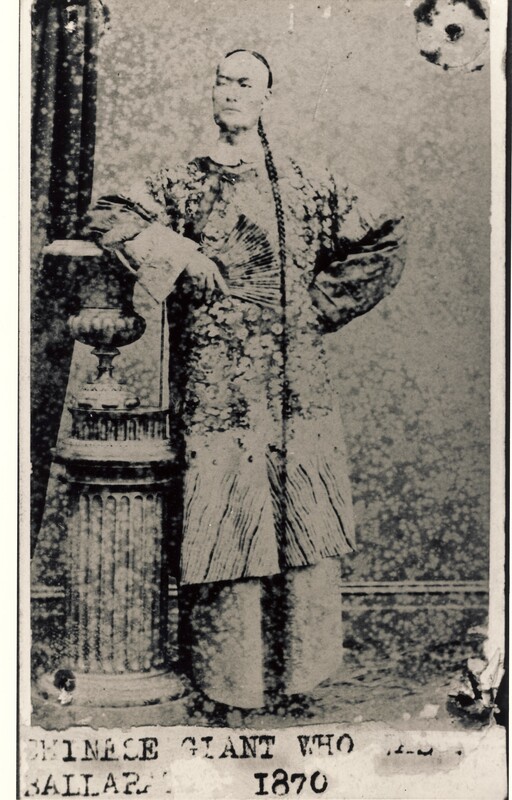 Back in China, it was compulsory for men to sport this ‘do’, which involved shaving the front of the head, and growing the back very long and wearing it in a plait. 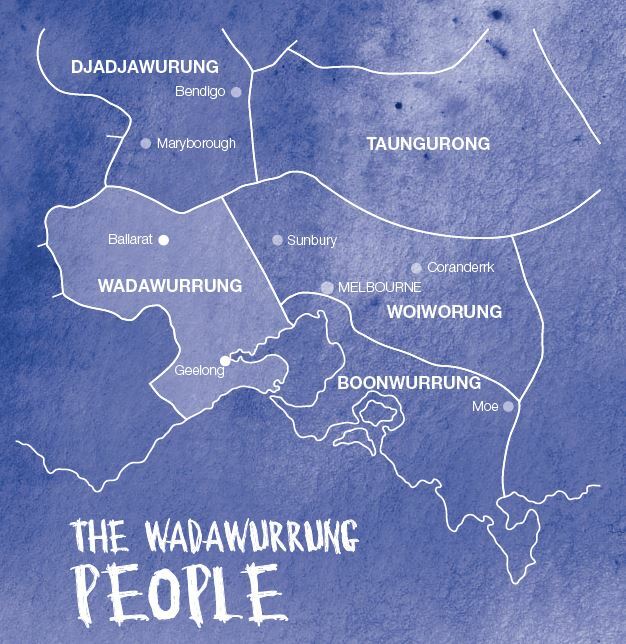 The Aboriginal people of this region – the Wadawurrung people – may have worn their hair differently to the Europeans and the Chinese; however, from the limited photographic evidence we have, many appear to have adopted European hairstyles by this time. 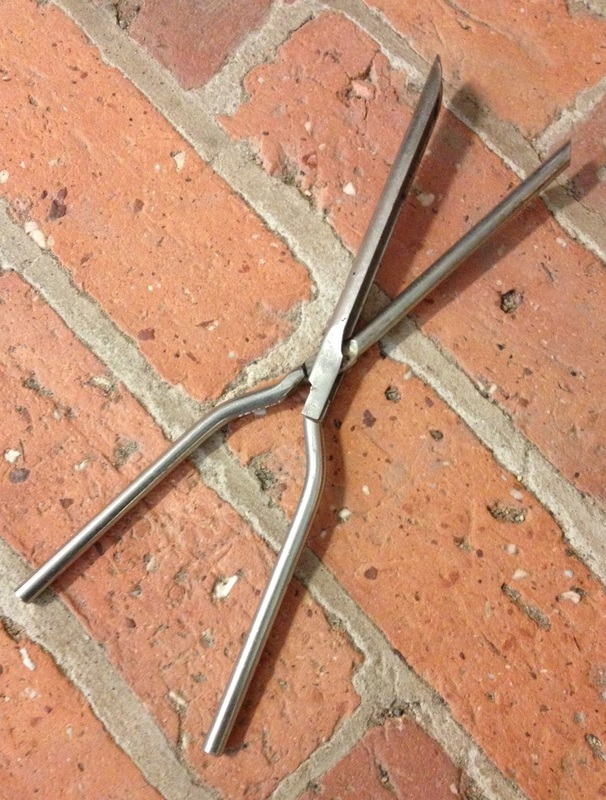 Marcel curlers, also known as hot curling irons or hot curling tongs. An exploration of 19th century hair in Australia wouldn’t be complete without a mention of the fashion for hair artworks and even hair jewellery, which was commonly something a lady would give to her lover, or someone would make from the hair of a recently deceased loved one. You can see lots of examples of this curious practice here. Another weird habit of European women in the 1800s was the collecting of hair from a hairbrush to use as padding to create certain hairdos. Hair was collected in a ‘hair receiver’ and then moulded as required into a ‘rat’ to place inside a bun or to give hair volume. Lastly, the rather terrifying ‘Marcel Wave’ hair curler became popular towards the end of the century, even though it was very easy to burn your hair off while using it – it was heated in the fire before being applied to hair! 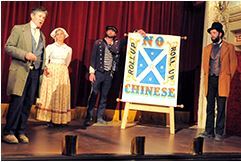 Every day at 12noon in Sovereign Hill’s Victoria Theatre, a group of the Outdoor Museum’s wonderful performers present a pretend community meeting called the ‘Anti-Chinese League’. What is it about? 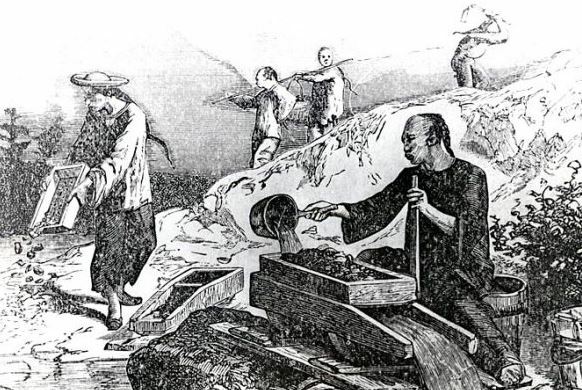 19th century Chinese gold miners. Artist and date unknown. Most Chinese miners arrived in Ballarat in the late 1850s (their population peaked in 1857 at approximately 7,542, or a fifth of Ballarat’s population). These Chinese people were the only cultural group on the Victorian goldfields to be forced to live in segregated camps. At most, there were 6 Chinese camps in Ballarat during this time in history. These camps were often deliberately built (on guidelines from the British Government of Victoria, called the ‘Colony of Victoria’) in the worst parts of the settlement, usually at the bottom of a hill where all of the nearby human/animal waste would flow when it rained. This was one strategy the government used to try to discourage more Chinese from coming to Australia. The Chinese were quite determined to be successful in Australia however. So, many used this free ‘fertiliser’ to grow productive vegetable gardens. The Chinese were also forced to pay a Residence Tax and Protection Fee to the government once they arrived on the goldfields, which at times was as high as $1,000 per month in today’s money! Again, they were the only cultural group in Victoria to be treated like this. But worst of all, the government imposed an Arrival Tax that only applied to the Chinese. This tax of £10 would be equal to almost $10,000 today!! This huge amount of money was to be paid by every Chinese person who arrived by ship in Victoria. To avoid this tax, many Chinese miners arrived in Robe, South Australia, and walked from there to Ballarat – a distance of 400kms! Why were the Chinese discriminated against? 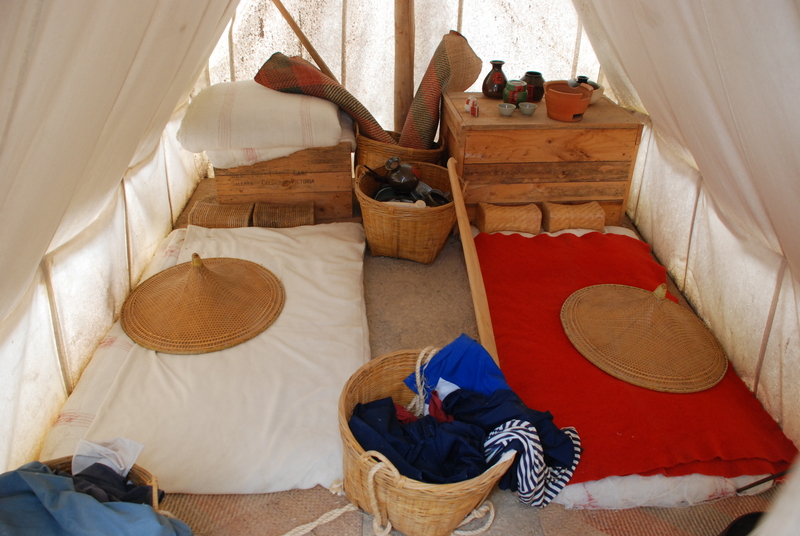 Typical living conditions for Chinese miners on the Victorian goldfields (visit Sovereign Hill’s Chinese Camp to see more examples like this). Today, Ballarat is proud of its multicultural community, but during the 1850s gold rushes there were many European miners on the diggings who wanted to keep Chinese people out of Australia. And, unfortunately for the Chinese, many members of the British Government of Victoria at this time also wanted them gone. 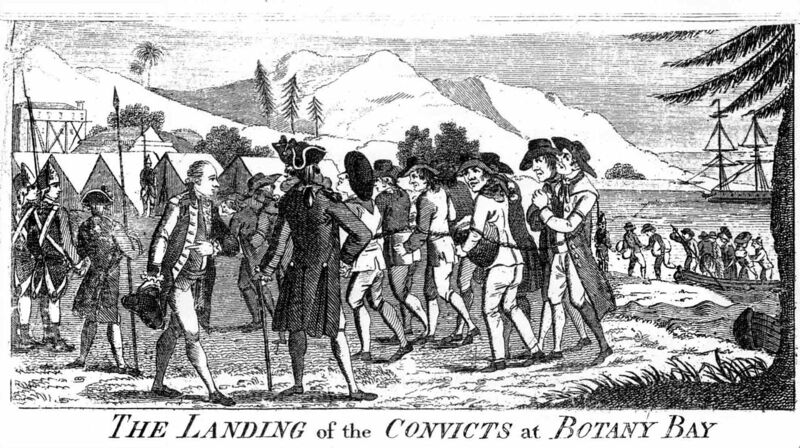 By today’s standards, it could be said that many of these Europeans both in Ballarat and in the British Government of Victoria were quite racist towards the Chinese, and caused them to suffer both on the journey to Ballarat, and while they were searching for gold like the thousands of others on the Victorian diggings. The belief that human races have distinctive characteristics which determine their respective cultures, usually involving the idea that one’s own race is superior and has the right to rule or dominate others. Offensive or aggressive behaviour to members of another race stemming from such a belief. A policy or system of government based on it. 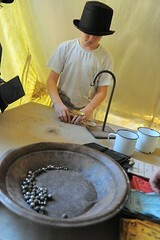 There were many cultural differences between Chinese and European people on the diggings. A fear of difference is often the cause of racism, and sadly this is true in Australia even today. People who look different to you, or practise a different culture or religion etc. are no better than you, no worse. They are just different. If everyone on Earth was the same, what a boring planet this would be! 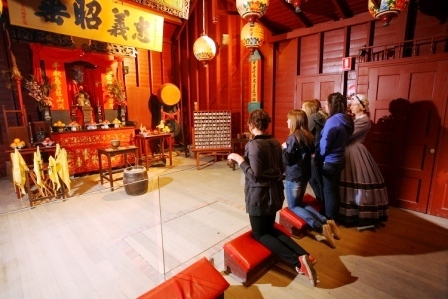 Students learning about Chinese religion on the goldfields at Sovereign Hill’s Joss House, located in the Chinese Camp. Here’s a table demonstrating some key cultural differences between most Europeans and most Chinese in Ballarat in the 19th century. You can imagine that a 19th century European might have been shocked to meet a Chinese person for the first time, and visa-versa because of such cultural differences. This experience is called ‘first contact’. Chinese men wore their hair in long plaits called queues – Chinese law said they had to wear their hair like this. Most European men wore their hair neat and short unless they were really scruffy miners. Hair styles could depend on one’s social class. The most popular religions in China during the gold rushes were Taoism, Chinese folk religion (ancestral worship), Chinese Buddhism, and Confucianism. Most Europeans were a kind of Christian: Anglican, Catholic, Protestant, Methodist, Presbyterian etc. Chinese miners typically wore silk or cotton outfits called tangzhuang or changshun and often wore no shoes or hats. European miners typically wore shirts, jackets, waistcoats and trousers made of cotton or wool, along with thick leather boots. They always wore hats when they were outside. Most of the 1850-60s Chinese miners had a farming background and had lived in the countryside. Most of the Europeans had an industrial background and had lived in big cities. Most of the Chinese here in Ballarat during the gold rushes spoke Cantonese. Most Europeans spoke English. The British Government of 19th century Victoria was motivated to keep the Chinese out of Australia because Britain was at war with China over the sale of opium, a dangerous and addictive drug. The British wanted to sell (Indian) opium to the people of China in return for tea (the favourite drink of the British Empire) and silk, but the Chinese Emperor was worried about the high numbers of his people whose lives were being ruined by this drug. As a result, China and Britain (with the help of France the second time) fought two ‘Opium Wars’, the first from 1839-42, and the second from 1856-60. Sovereign Hill celebrates Chinese New Year every year to acknowledge the Chinese community’s contribution to 19th century Victoria. The main reason the government ultimately chose to make life difficult for the Chinese in Australia was due to loud, but small groups of Europeans on the various Victorian diggings who often called themselves an ‘Anti-Chinese League’. They complained about the Chinese so much that the government felt it had to do something. Here are some of the main arguments used by racist European miners etc. which encouraged the government to create policies like the Arrival Tax and the Residence Tax (apart from using it as a general way to make money through taxes, like a Gold Licence [before 1854], for example). The text in italics represents the kinds of opinions held by members of the Anti-Chinese League. 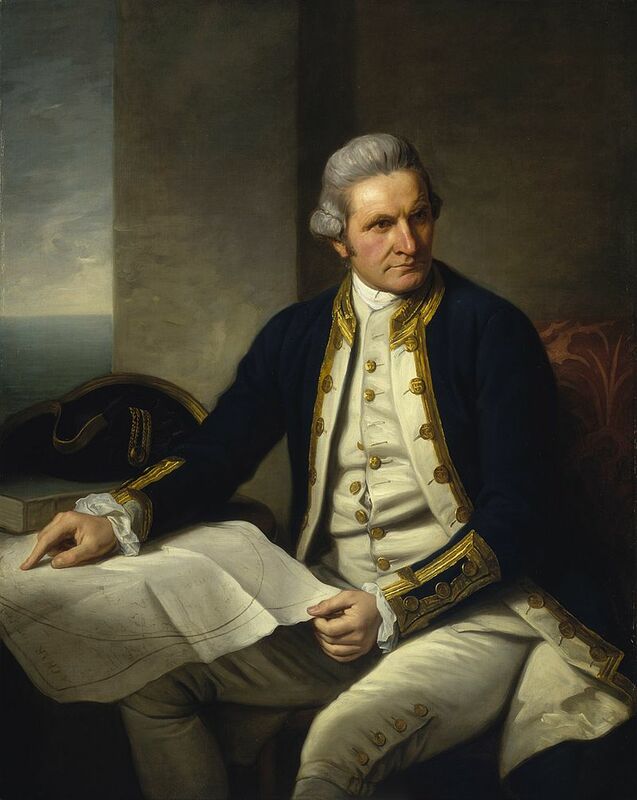 ‘The Chinese aren’t coming to contribute to the development of the Colony. They just find gold and then return to China to make their families rich.’ This was true, but many Europeans and Americans did the same thing. Some Chinese had to return home with their gold to use it to repay debts in China. However, those who wanted to stay in Australia often found it difficult to make enough money to buy a house, or set up a business as a result of the money they had to pay in Arrival and Residence taxes. 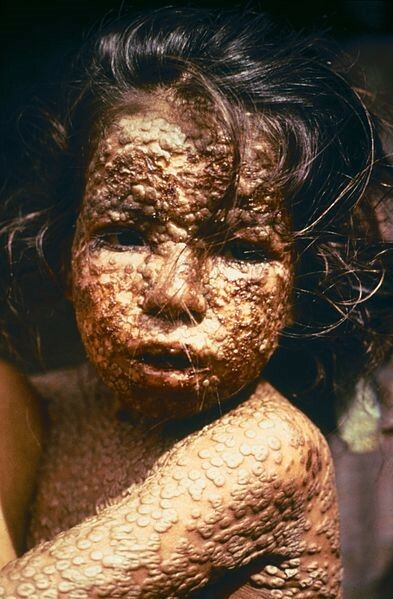 ‘The Chinese bring disease.’ Some Europeans believed that the Chinese brought dangerous new diseases with them from China, while others thought the goldfields living habits of the Chinese would generate diseases like dysentery and typhoid. However, there is no evidence that disease was more common in the Australian Chinese community than it was in the European community in the 19th century. ‘As the Chinese men come to Australia without their wives, their ‘loneliness’ can cause trouble.’ The Chinese couldn’t afford to bring their wives on account of the Arrival Tax, and in Chinese culture it is very important to look after your parents in their old age. Many Chinese women stayed home in China to do just that, in addition to looking after their children and the family farm/business. ‘The Chinese don’t mine fair!’ Chinese miners and European miners searched for gold differently, and to the frustration of many Europeans, the Chinese methods could sometimes find gold in abandoned European mines. The Chinese argued that the gold would be ‘lost’ if it weren’t for their re-working of abandoned mines. ‘The Chinese are stealing Queen Victoria’s gold!’ Some Europeans complained that Ballarat’s gold belonged to Queen Victoria and the British Empire. Therefore, they thought the Chinese should keep their hands off it. However, there were plenty of American, Dutch, French, Italian etc. people in Ballarat who weren’t British subjects either, and they didn’t experience racism like the Chinese did. 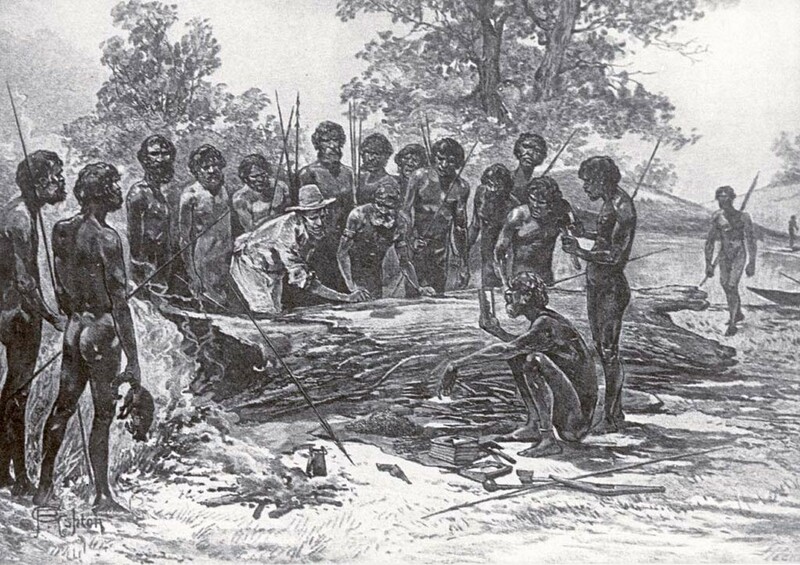 And if the gold belonged to anyone, it should have belonged to the Aboriginal people of Victoria. More detail on these complaints from Europeans can be found here. Sadly, many Chinese miners on the Australian goldfields experienced violence at the hands of Europeans who held these racist views. Some even had their queues (long hair braids) cut off, and occasionally they were even scalped! 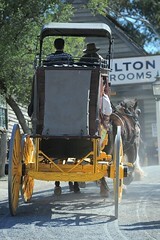 Sovereign Hill’s performers hard at work. Sovereign Hill’s talented performers act-out this pretend Anti-Chinese League meeting and talk to the audience afterwards to explore this dark, racist part of Victoria’s history. Many audience members are shocked by what they hear our perfomers say during this performance, but ultimately it gives people the opportunity to think about and discuss the dangerous impact that racism can have on Australia. Next time you visit Sovereign Hill, come along and see this provocative performance for yourself!